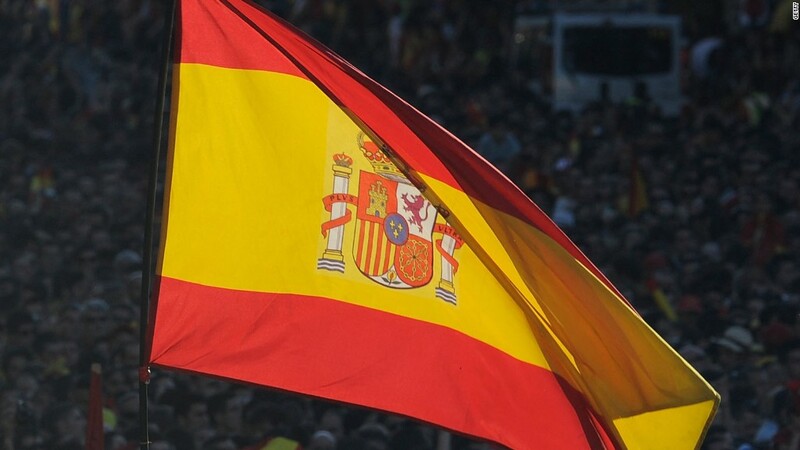 Can Spain sustain its economic turnaround? Spain was on the brink of collapse three years ago. Now the country is surging ahead. The fourth biggest economy in the eurozone has just reported its eighth successive quarter of growth, and the pace is picking up. Gross domestic product grew by an annual rate of just over 3% in the second quarter, making it one of the fastest growing developed economies in the world. And it's not alone. Five countries were bailed out by their European partners during the region's debt crisis, and of those only Greece is still going backwards. Here's a look at how things have changed. Spain has been growing steadily for the past two years, leaving its economic troubles firmly behind. The country did not have excessive debt in the run up to the global financial crisis. But its banks were brought to their knees when a housing bubble collapsed. Europe's bailout fund loaned Spain 41 billion euros ($45 billion) to rescue the banks, and prevent the economy collapsing. In return, the Spanish government introduced a range of reforms aimed at making the economy more efficient and productive. Some were very controversial -- such as making it easier and cheaper to fire workers, and giving companies greater freedom to set their own wages and working hours. The result: Even the painfully high unemployment rate is now falling steadily, down from 26% in 2013 to 22% in May. Ireland was the first eurozone country to fall into recession in 2008. It received 67 billion euros ($73 billion) in international bailout loans in December 2013, after its property market collapsed and banks started failing. But the country has now regained its "Celtic Tiger" role, having grown faster than any other eurozone economy in 2014. And it continues to roar this year. Final data for the first quarter show expansion of 1.4%, equivalent to annual growth of a whopping 6.5%. Over the years, Ireland has become a magnet for global tech giants, many of whom have their European headquarters in the country. The Irish stock market is up 17.5% this year, investment is booming, and Ireland has been cited as an example for Greece by the International Monetary Fund. Portugal received 78 billion euros ($85.6 billion) in bailout loans in 2011, after failing to get its budget deficit under control. Like other rescued countries, Portugal was prescribed painful and deeply unpopular economic reforms, aimed at restoring its competitiveness. The bitter medicine worked. 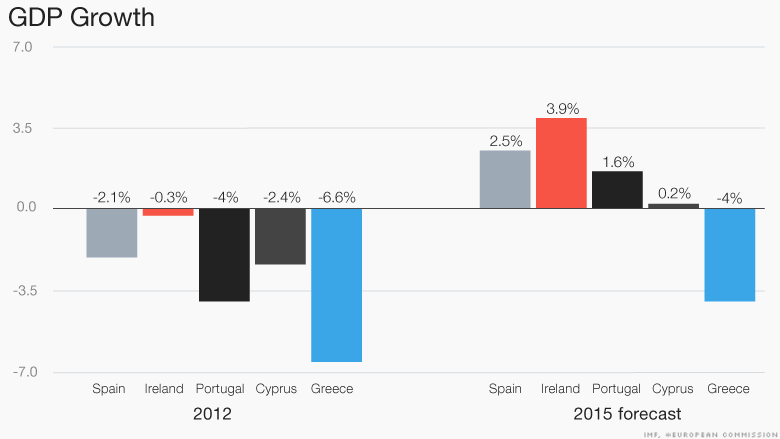 Portugal exited the bailout program in May 2014, and the IMF expects growth of 1.6% this year. The country said in January it would repay the IMF portion of the bailout early because it can borrow commercially at record low interest rates. Cyprus got into trouble in 2013, when its financial system began to collapse. Like Greece recently, it was forced to close its banks for an extended period to prevent a complete meltdown. It secured a bailout package worth 10 billion euros ($11 billion) in March 2013. In exchange for the money, it too had to implement a number of economic reforms, including public spending cuts, and a privatization program. The crisis took a heavy toll but Cyprus' international bailout monitors said earlier this week its reforms were on track, and the country should be able to stand on its own feet financially as planned from March 2016. Greece might have avoided a catastrophic exit from the euro, for now, but it remains in deep economic crisis. In fact, its statistics look as bad as those of a war torn country. The European Commission says Greek GDP may shrink by as much as 4% this year. Just last summer, the IMF said Greece was on track with its reforms, and looked like it would not need any more bailouts. But the election of a radical left-wing government set the process back, as reforms were reversed and the country engaged in a six-month standoff with Europe and the IMF over bailout terms. The government was forced to admit defeat earlier this month, formally requesting Greece's third bailout since 2010. It is now negotiating the details -- but one thing is sure: There's more economic pain to come.